I was worried about Jana’s reaction to the new puppy. She’s never been fond of puppies, to understate the situation. Usually, she pretends any nearby puppies simply don’t exist. If a puppy gets in her face, she usually raises a lip in warning and puts considerable distance between herself and the little brat. So, I wasn’t at all convinced that bringing a puppy into our one-room temporary home was a great idea. Then Cali arrived with all her sunny friendliness and puppy charm. Within a few days, the first miracle: I caught them tugging on a toy, Cali’s comical puppy growls mimicking Jana’s play growl. The next day, the truly impossible happened: Jana forgot her elder-dog, anti-puppy dignity and actually invited Cali to play. It’s happened a number of times since then. In fact, when I start playing with them, they quickly re-engineer the game — to exclude me. I am beginning to feel like the waitress / doorperson / spa attendant. 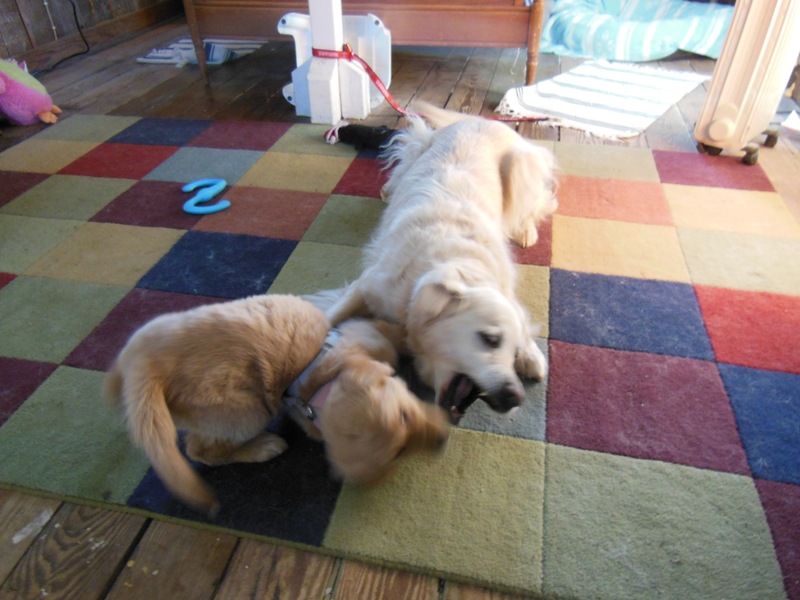 See them in action here: Cali and Jana playing. Jana eagerly shows Cali what to do in training sessions and is teaching her all kinds of ways to have fun — roll in the grass! Eat mulch! Ignore Mom when she calls you to come inside! Drive Mom crazy by asking to go out every 5 minutes! Especially when it’s raining! Cali watches worshipfully and carefully mimics everything Jana does. She so badly wants to be a big girl just like Jana. There are lines though. Carrying the paper up the long, long driveway is Jana’s job, and Cali really needs to learn that. In fact, after wrestling the paper away from Cali this morning, Jana showed her outstanding work ethic: As we rounded the corner of the house, she spied a cat! She lunged, barked, lunged again, barked some more — all without letting go of the paper. I suspect she was putting on a show partly for Cali’s benefit. There are minor areas of tension. Certain special bones are Jana’s. Only Jana’s. When Jana is choosing a toy, Cali had better stay away from the toy box, no matter how long it takes Jana to choose. And if Jana changes her mind and wants the toy Cali has, well, she is the big sister. Like most big sisters, Jana is often bossy and never lets Cali forget who is in charge. At the same time, she’s amazingly patient with Cali’s boundless energy and need to play, bounce, cavort, run, jump, spin, and generally demand attention. Cali has gone too far only once, and she got a slightly nipped ear to impress upon her the foolishness of disregarding Jana’s warnings. Mostly, though, they are polite and appropriate with each other, they wrestle and tug and play happily together, and they share their toys far more amicably than most human siblings. They are both girlie girls; their favorite toys are all pink. Small, purselike toys are popular, as is the bright pink pig that Jana selected on her first trip to a PetSmart several years ago, and a huge (pink) owl. They both like to play tug (with the pink rope), and both are highly food motivated. In some ways, though, they couldn’t be more different. Jana is very analytical and extremely selective about which people (or dogs) she’ll allow into her personal space. Cuddle? Hands off, please. Cali, on the other hand, has no concept of a “stranger.” Each human and dog on the earth, she is certain, was placed here to be her best friend — especially you. In fact, she just can’t wait to meet you. And you, you, and you. When she does, she’ll smother you with kisses, her tail madly wagging the whole time. Come to think of it, how could Jana resist? How could anyone? Wow! The power of family. Nothing like the Puppy House. Jana, you go girl! We thoroughly enjoyed your writing about Cali and Jana. Cali is adorable. Hopefully we will be getting a puppy within the next few days – a little Shih Tzu. We put a deposit on a puppy lat April and went to see the puppies when they were 6 weeks old, and now are waiting for another customer to pick one of the litter to start her own line of Shih Tzus and we have to wait until she makes her decision. They will be 10 weeks old Wednesday so we are hoping to get it sometime this week. The puppies are in Kalispel. Anyway, hope you all are doing well. GREAT blog post! I LOVE seeing all the pics on fb. She will be a big girl in no time. I keep thinking about getting another dog just can’t seem to do it. Hope all is well with you. Sweet piece. Cali is already looking pretty sturdy. Jana is showing a lot of foresight in setting the boundaries while she can. Next photo I’d love to see is Jana barking at a cat with her mouth full of newspaper!